Dhuck is Korean for Rice cake, as I have written before. It is similar to and does in fact include the Japanese Mochi variety. We call it Mochi Dhuck. Mochi is a very delicate, soft variety of rice cake and normally filled with red beans, green tea paste, sesame seed paste or a plethora of other fillings. 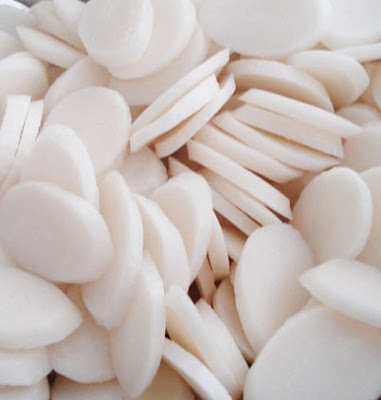 For Koreans, it is only one type of the dozens of different types of Rice Cake. The term cake is not only used here to describe the shape or form you buy or make it in, though many of the Dhuks can be bought in 'cake' or block forms. It is also quite descriptive of its regard. It was and is a treat. During much of the impoverished Korean history, rice was a very expensive commodity. Often, poorer families would have to make due with other cheaper grains like Sorghum. Dad told me of times when they would stretch out what little rice they had for days by adding hot water. It is still a comfort food today. He told me of the really hard times during the war when his family was fleeing Japan and settling back in Korea and what little they had to live on. My Grandmother would often go to the Rice mill to collect the husks for fuel to heat the house. Dad credits his mother for having saved the family. In those days, Rice cake was a pure luxury. If you were so lucky to have the rice to have made into Dhuk, you were expected to share with the village. Then it was the more simple, plain rice cakes like the one with red bean layers much like a frosted cake or the simple plain 'rods'. These are the most common. They are uniform in colour and texture. They are very chewy. They come in rods about 1 inch in diameter and you can buy them cut into 5 inch pieces or sliced on the oblique in oval 1/4 inch thick pieces. When we were kids, we used to bake these or dip them in sugar. 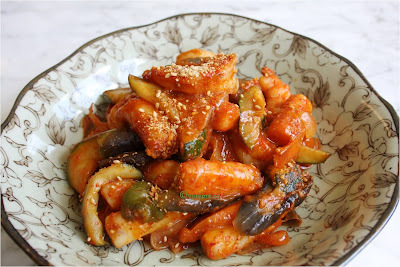 You will often see these slices or smaller rods used in Dhuk Bokki, or Spicy Rice Cake, a popular dish made famous from its origins as Street Vendor food. One tradition that is still held by many Koreans abroad is New Years. Koreans also follow the Lunar Calendar and our New Year coincides with the Chinese New Year. The dish that is most commonly served for Korean New Year is Dhuk Guk or Rice Cake soup. Mom made it for me before I flew home to Vancouver to celebrate New Year's at ours. 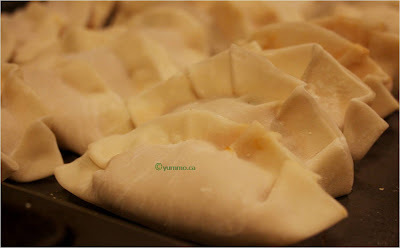 Now the traditional is a beef bone broth base with Mandu (Korean dumplings) stuffed with beef or pork. This adaptation is something mom had to develop for me and my sister V. The broth is a preserved anchovy broth which is also common in many Korean soups but mom has had to extend its use to all soups that normally use a beef or pork rib base like Kimchee Chigae. As well, her Mandu is one we have blogged in the past, was an adaptation for V and I. Now mom does not follow recipes for Korean food, nor does she write them down, so this is based on observation. I cannot find the photo of the soup itself, only the some of the ingredients. I may have packed my camera ready for the airport by then. Too bad. Next visit. In a big stew pot or dutch oven heat 1.5 - 2 l of water with a 1/2 c of Milchee. If you wish, you can wrap the Milchee in cheese cloth so you do not have to fish it out with a skimmer. I just let it settle at the bottom of my bowl. My mom skims it out. Simmer for 30 minutes - 1 hour. Mom calls this preparing the Milchee Mul, or Michee Water, literally. You could also add Myuk, a thick seaweed used in soups. In Japanese markets, it comes in single slabs called Kombu, or at least, that is an pretty good approximation. You will want to fish either out for aesthetics before serving. Separate the whites and yolks of three eggs. In a large non stick fry pan, heat some peanut oil on medium. Add the white and fry in single thin sheet. Turn when ready. You don't want to brown. I do not like that flavour. Do the same with the yellow. Cool slightly and slice into strips about 1/2 cm or 1/4 inch thick like ribbons. This is garnish. You can leave it out but why would you. On a low burner, toast the Kym. Most Kym comes pre-toasted but mom buys the bulk kind a Korean household would and it is not toasted. You need to brush with sesame oil and toast on both sides for only a few seconds by holding the sheet with chopsticks and drawing it across the burner like you are stroking it. Cut into ribbons like the egg. This too is a garnish but not optional like the egg. Defrost the Mandu if you are using frozen. Slice the sesame oil, garlic and ginger and add to the clarified Milchee Mul. Simmer for a few minutes. This will go quickly now because you do not want to over cook anything from this point. The heat should be on medium low. Just below simmer. I.e. no bubbles visible but steady steam wafting. Add the Dhuck and heat through for 3-5 minutes. Whisk the other three eggs briefly just to break the yolk. Swirl the pot with chopsticks and pour the egg in so you get ghostly strands of egg throughout, basically the opposite of what you want in a poached egg. Add the Mandu. Heat through for 3-5 minutes. Serve HOT! Ladel into a large Korean noodle/soup bowl. Top with the egg ribbons and top with the Kym. Sprinkle some toasted sesame seeds. YUUUUMMMMO! We used to have this much more often than just New Year. It is fantastic when it is cold out and SUPER EASY. If you do not have Mandu, no biggie, you can leave them out. Dhuk Guk is often just the Dhuk. My belly was full of this on the plan home to Vancouver so obviously slept through any of the movies showing.